Joe Friel, author of The Triathlete’s Training Bible, analyzes pro triathlete Jordan Rapp’s winning power file from the 2012 Ironman US Championship in New York, NY. On August 11, Jordan Rapp won the 2012 US Ironman National Championship in New York City with a impressive time of 8:11:18. He came out of the water in 14th place and more than two minutes behind Luke Bell. But a field-best bike leg (4:26:34) followed by the fastest run of the day—and the only one under three hours (2:59:21)—put him across the finish line more than 13 minutes ahead of second-place Maxim Kriat. The way he managed his energy resources on the bike had a lot to do with Jordan’s race performance. There’s a lot to be learned from how he did it. Let’s take a look by analyzing the file from his Quarq power meter. 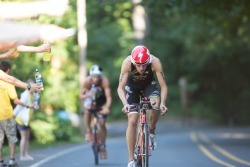 When analyzing an Ironman bike performance there are three things I examine. Here they are with how Jordan did in each of them. This is a measure of the level of exertion it took to finish the bike leg. In power-speak, IF® is Normalized Power® (NP®) divided by Functional Threshold Power (FTP). NP may be thought of as average power only with more value given to the power spikes throughout the ride. These spikes are very expensive in terms of energy expenditure and so NP gives a good proxy for the metabolic “cost” of the ride. FTP basically tells us what the athlete’s max, one-hour sustainable power is. And since an Ironman bike leg definitely takes longer than one hour, NP must be well below FTP or the athlete will blow up very early in the race. But if NP is too low relative to FTP (a low IF) the rider will have ridden too slowly. The longer the time on the bike, the lower one’s IF will be. Conversely, the faster the bike split, the higher the IF. This is simply because of cumulative fatigue. You can ride harder when the duration is shorter. Most age groupers riding 112 miles in around six to seven hours will have an IF of roughly 0.7 to 0.6. That’s mostly in the zone 2-power range. The pros typically ride with an IF of about 0.75 to 0.8. By riding in a time-appropriate IF you don’t produce your best time possible, but rather your best time that still leaves something for the marathon. If the IF is too high you are likely to jog-walk the marathon. Too low and you run a personal best time but have a slow overall race time. Jordan’s IF in NYC was 0.8. That means his NP of 297w (4.2 w/kg) was 80% of his FTP (373w, or 5.3 w/kg). At the upper end of what is typical for the pros, this helps to explain his fast bike split. And given the fact that he had the fastest run split of the day and the fastest overall time, it’s apparent that he got his IF just right. IF is honed on long, race-effort training rides. Having a power meter on-board during the race greatly increases your likelihood of getting IF right. It’s possible to get your IF right and yet blow up during the bike leg due to poor pacing. Frequent and high accelerations and correspondingly low decelerations over the course of several hours may still give a good NP and therefore a solid IF, but the cost of such surging is quite costly. These surges often occur when being passed, climbing a hill, or going out much too fast at the start of the race. VI is calculated by dividing NP by average power, and essentially measures how “smooth” your power output is. The closer to 1, the smoother the ride. I like to see a VI in an Ironman of less than 1.06. That means surges were kept under control and so energy was not squandered. This is where patience and confidence appear in racing. Athletes who are impatient and don’t trust that they are pacing correctly will have a high VI. Jordan’s VI for the bike was 1.03 (297 / 288 = 1.03). That’s well below 1.06 and means he did a great job of riding steadily. And I can’t say this often enough, conserving energy on the ride is critical to success in an Ironman. There’s an old saying in bicycle time trial racing that holds true in Ironman also: When the course is slow, ride hard; when the course is fast, ride easy. The course is slow when you are going uphill. This is the time to increase your power output—within reason. It’s certainly possible to go much too hard—high VI. The rule I use for Ironman is that your power is not to go more than two power zones above your IF-appropriate zone for more than about five minutes at a time with a limit of 20 minutes cumulative throughout the race. So if your goal zone for the race is zone 2, you may go briefly to zone 4 on hills, but for no more than 5 minutes at a time. The durations at this higher zone can vary with the rider, but I’ve found that this rule generally holds true for most. The course is fast when going downhill, so now is the time to reduce your power output. At the fastest speeds, trying to put more energy into the “system” is extremely costly. As speed increases linearly on a descent, the power needed to go even faster increases exponentially due to air resistance. So while speed may increase 25% due to the downhill, going faster yet demands something like a doubling of the energy due in large part to the increased headwind and drag. That results in a lot of glycogen being burned and an increase in blood acidosis. These are not things you want happening during an Ironman. So how did Jordan do with pacing? He rode the way most pro triathletes do it. His Quarq power meter shows that he went out fast at the start but still relatively steady in the first quarter of the race (309w or 4.4 w/kg) and then decreased power as the race progressed and fatigue set in. You can see the slight drop in the power graph over the course of 112 miles. Going out fast is not recommended for age groupers. There are many reasons the pros do this. One is mental: “Out of sight, out of mind.” The other is that even though drafting is not allowed, with other riders, media and race support vehicles around the leaders there is a lot of air being moved in the right direction. Being near the front early, even if separated from other riders, puts a pro in this river of moving air. That’s something age groupers don’t need to be concerned with. If you examine the power graph relative to the terrain you can find several instances where Jordan increased power on uphills and decreased it on downhills. For example, at around mile 65 he started a 5 km descent on about a 3% grade. His average power was 190w with most of that coming as the hill just started to dip down. For the entire 5 km he averaged 53 kph, and he coasted for much of it in order to conserve energy. It’s not about producing high power numbers when racing. It’s about going fast for the least possible energy expended. Downhill is where time is maintained while energy is conserved. Uphills are a different story. On the short, steep hills you’ll see that his power spiked. This is where you make up time on the competition, but it’s costly and so must be well-rationed. How hard you can go depends on how long the climb is and what your FTP happens to be. For Ironman racing it’s best not to exceed FTP on climbs, as the cost of doing so is extreme. How high you can go must be determined in training, on hills that are similar to those you will race on and utilizing the “two-zone rule”. And of course, you must realize that on race day cumulative fatigue for the entire day to a given point in time must be respected. If you make a mistake here, make it on the side of being too conservative on uphills. You still have to run. Jordan appears to have done a nice job of parsing out his energy on hills based on his 2:59:21 run split, which was the fastest of the field that day. Also, notice how he backed off in the last 11 miles to prepare for the run. Average power here was 260w (3.7 w/kg) but speed remained relatively high due to the 300-foot descent into T2. His cadence now was lifted a bit to 80 rpm from the mid- to high- 70s previously. This may help in physically preparing for the higher cadence of the run. Jordan’s finishing time and numbers are impressive here. It’s obvious that he nailed it on the bike. And that set him up for a fast run. There is a basic truth that always holds up when it comes to Ironman: If you want to have a fast run, get as fit as you can on the bike and then race well within yourself. This comes down to riding at the proper IF, keeping VI low, and properly pacing the course. These are the keys to an optimal bike performance in an Ironman. TrainingPeaks would like to thank Jordan Rapp for contributing his race data. Jordan will be heading to the Ironman World Championships in Kona this October. You can follow his training on his blog, Rappstar Racing, or on Twitter @rappstar.